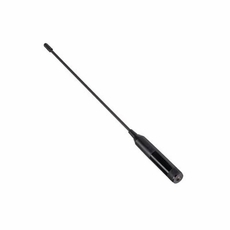 The FW.45 is a flexible 450-470MHz whip antenna with a SMA type (M) connector for outdoor use. It features excellent efficiency (>70%) and peak gain (>1 dBi) at 450-470MHz on a 30x30 cm ground plane. Common applications are smart metering, gateways, wireless monitoring, and mesh networks. The FW.45 has an excellent omnidirectional radiation pattern, ensuring wide coverage. The antennas high efficiency means that it allows your radio to consume less power than with a lower efficiency antenna when transferring data. It also means a better signal strength and better sensitivity in areas of low signal levels. The antenna performs at its best while attached to a ground plane with dimensions of at least 30x30 cm. For an environment where there is no ground-plane available we recommend to use the fiberglass omni OMB.450 antenna.